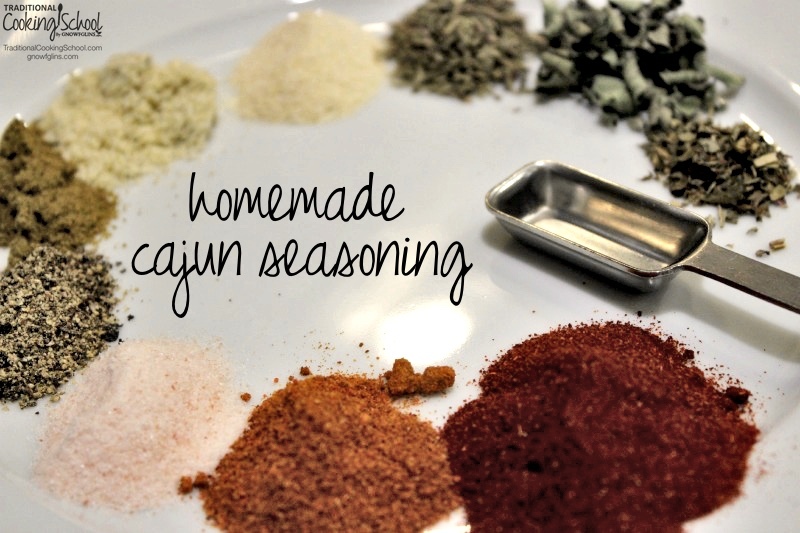 Although their basic seasoning combination is simply cayenne, salt, pepper, and garlic, it can get much more complex with up to 20 different herbs and spices! 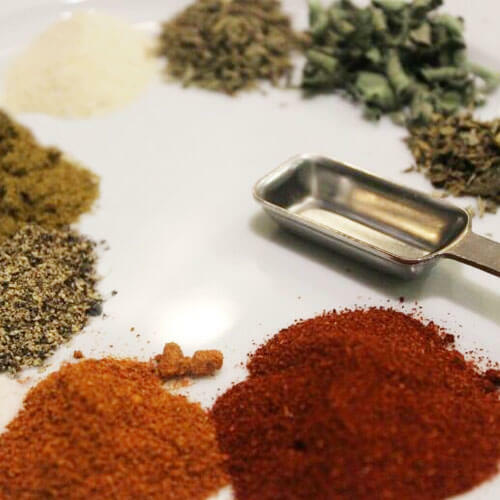 I use eleven different seasonings in my blend (below), which creates a nice combination of spice and flavor. We do like it spicy though, so feel free to adjust the cayenne pepper according to your preferences. Catfish can be found nearly everywhere, but I think many folks in the South would claim them as their own. Their meat ranks high on the list of comfort foods for many a Southerner who grew up catching them, rolling them in cornmeal, and frying them. This document from Southern Foodways Alliance gives non-Southerners a little insight to the lore of the catfish. While Hemmingway's fish tale may have hooked a Pulitzer, it is the catfish that people sing about, even in front of the President. Lore and mystique aside, the catfish is often thought of as a bottom feeder. Actually, they are omnivores happy to eat food (worms, bugs, other fish, algae, and plants) wherever they find it — whether it's on the bottom, at the top, or in between. Catfish actually make up 60% of all aquaculture production in the US. Most of it available in stores in farmed, but according to the Monterey Bay Seafood Watch, US-farmed catfish is a “Best Choice” because it is sustainably-farmed with a very low risk to the wild population. They are also usually farmed without the use of antibiotics. When buying farmed catfish, make sure it was raised in the US. Unfortunately, most farmed fish are fed corn, soy, or rice pellets, which are probably contain GMOs. Carolina Classics, a fishery, offers certified antibiotic-free catfish through Whole Foods and Earthfare. 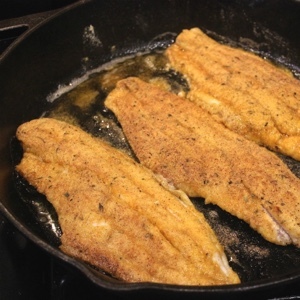 If you have access to wild-caught catfish, or know how to catch and prepare it yourself, that is your best bet for the most flavorful, most healthy fish. 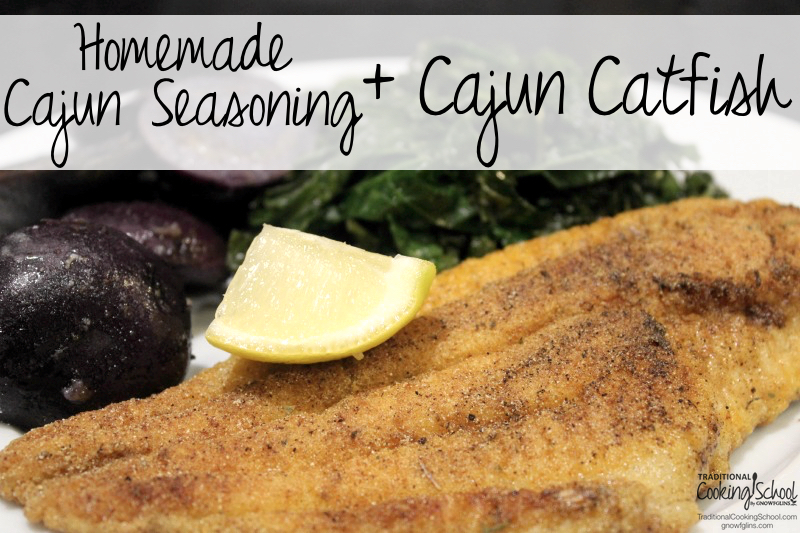 Delicious with sausage, roast chicken, or our family's favorite Cajun Fried Catfish (see below). Combine all herbs and spices. Store in a tightly closed jar and use whenever you need a little kick. Accompany with cornbread, greens, baked sweet potatoes, sliced fresh tomatoes, and green onions for a real down home Southern dinner. Combine seasoning, salt, and cornmeal in shallow pan. Heat dripping in cast iron skillet over medium high heat. Rinse the fillets and pat dry. Dredge the fillets in the cornmeal mixture, coating both sides evenly. Gently place the fish into the skillet, adjusting heat to medium. Cook fish on the first side about 4 minutes, then gently turn with a large metal spatula and cook on the other side for another 4 minutes, adding more bacon drippings if necessary to prevent sticking. Enjoy your down home Southern dinner! Be sure to let me know how spicy you like it! My husband really likes catfish but I have yet to acquire a taste for it. We have a pond and have often talked about stocking it in order to raise our own. I live in south Louisiana & fried catfish is on the menu at every seafood restaurant. Since reading they are bottom feeders I’ve been a little hesitant to eat it. My daddy always has some in his freezer & the next time we have a fish fry I won’t feel like it is such a guilty pleasure! I’ll try not to think about the oil it’s cooked in & the fish fry he uses to coat & season the catfish… Maybe I’ll just try this myself! I’ve been living in Southern Louisiana for almost 45 years. I love catfish and all the other great seafood of the area. I did see that in your link to Amazon for the “sprouted cornmeal” that the product is actually described as corn flour. I agree with using corn flour (i.e. very finely ground cornmeal) rather than what is commonly thought of as (coarser) cornmeal. Corn flour makes a better coating for frying seafood. It adheres better (and therefore the oil doesn’t sop up into the fish). Also, the coating can be thinner than with using the coarser cornmeal, giving a light crunchy texture which I prefer to a heavier, doughy (and potentially more oily) coating. Other considerations for those concerned about the oil used for cooking fried seafood. You want to fry at an appropriately high enough temp. This quickly stabilizes the coating and therefore puts up the barrier to minimize the amount of uptake in oil calories that are being added. I would suggestif someone likes the flavor of butter for their frying (that is mentioned as an option in your recipe), that a good option is to use ghee (which is clarified butter that can be brought to a higher smoke point without burning since the mild solids in ghee have been removed). yes – good idea to use ghee which gives a nice flavor and doesn’t burn, thanks for mentioning that! Merci beaucoup! I just signed up here and am so glad to find that you are featuring some good ol’ Cajun food. My ancestry is predominantly French (1/2 Acadian French, 1/4 Canadian French) so of course I was excited to see a focus on the food culture here in Southern Louisiana. I’d love to see more variations of Cajun food: gumbo, Étouffée, shrimp and grits, and jambalaya. Making a roux is not easy when you can’t use flour. I just haven’t found a suitable substitute. I can do without most of the foods I grew up with but it would be nice to figure out a way to make them healthier. I also wanted to mention that the voyage of the French down the river into Louisiana is actually the French Canadians and not the Acadians. My paternal grandmother’s ancestors made that voyage in the 1750s and they were all originally from the Quebec and Montreal area. They never settled in the area of Acadie. It is correct that they left to escape difficult British rule. The Acadians (Cajuns) who settled in the New Brunswick, Prince Edward Island, and Nova Scotia area (Acadie) were expelled for their religious beliefs during the Le Grande Derangement in or around 1755 but were adrift on ships, sent back to France, or placed in slums in the north east states until the mid 1760s. My mother’s Acadian ancestors were on the first fleet of ships that carried the Acadians to Louisiana and they did not arrive here until 1765. It is a common misconception that the French Canadians and French Acadians are one in the same however the culture could not be more different. There are great distinctions since they came from different regions in France and settled in different areas and time periods in Canada (Acadians arriving in Acadie around the 1630s & French Canadians arriving in the Quebec area around the 1680s). The Acadians originally lived on the southern border of France near Spain which is why the Acadian French they speak often contains Spanish words and pronunciations. The French Canadians were originally from the north west region of France near the Mediterranean. I didn’t mean to give a history lesson there…I guess I can’t help it. 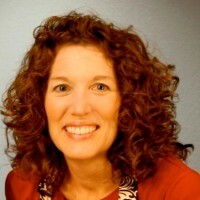 I’m a homeschool mom. Anyways, thank you again! Thanks for the history lesson – always appreciated! My dad grew up in Northern Maine where there are lots of French speakers and “Acadian” everything. We’ve taken the kids (homeschool fieldtrip!) to visit the Acadian History centers and living history villages in the area – but I still wasn’t clear on the distinction.